Music is a distinguishing aspect of the Sisters of Mercy, in their history and in their present reality. The Sisters brought music and song into the lives of thousands of Newfoundlanders through their teaching of individuals and groups from kindergarten to college, through the performance and achievements of their students, and through the composition of music for individual and choirs. 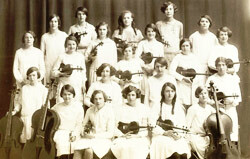 Nearly every Sisters of Mercy School had sisters to teach piano, choral work and instruments. Nearly every class had singing as part of their curriculum. Individuals received instrumental or voice training. The local parish choir was often directed by a sister. Though not currently employed as music teachers or directors, sisters continue to share their musical talents in the parishes or other facilities where they minister. One sister continues to compose beautiful music for liturgical functions and special events in the Archdiocese of St. John’s. A grand musical legacy continues to endure in the province and elsewhere and has been recognized throughout the world in the voice or musical talent of alumna of the Mercy music teachers.